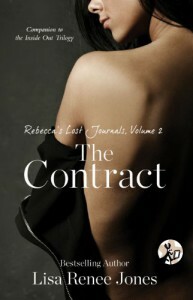 In volume two, we are introduced to "The Contract". Rebecca comtemplates whether or not she can commit to this relationship as defined in the terms. If Recbecca doesn't fully understand what the terms mean, how can she agree to them? If she says no, can she still have him in her life? There are "clues" as to who The Master is, but dang it, I can't figure it out yet! All the major players are present, and I'm actually leaning towards Ricco. I didn't even really give Ricco a second glance in If I Were You. He just didn't make much of an impact in If I Were You, but now........I guess I'll have to keep reading to find out.